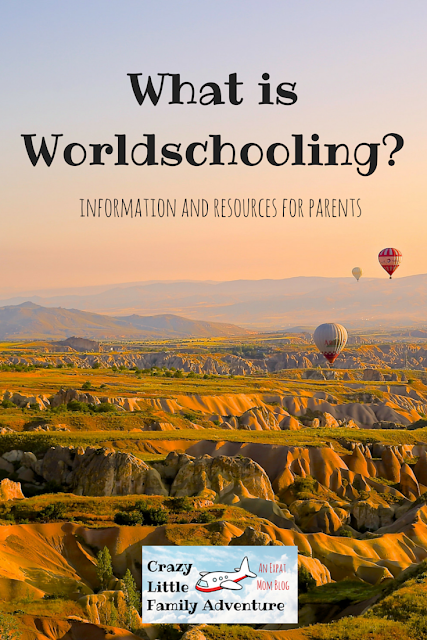 –> Check out The Ultimate Worldschooling Checklist! The definition of Worldschooling is as broad as it is magical. Imagine that the entire world is a learning opportunity, I do not say classroom because classrooms are confining, and the world is exactly the opposite. Worldschooling can be defined as “Learning from the World”, but how each worldschooling family does it can be different in many ways. The possibilities are almost endless, as long as the idea is the same; The kids and ultimately the parents will learn from living, from interacting with the world around them, be it their backyard, their town, their city, their country or the entire planet. The parents educate their kids on the road, in any way they find fits their family best. Come along and discover the kinds of families that Worldschool, and maybe you will be inspired to do the same with your kids. The main idea is to be open to all possibilities, find the learning edge for every experience and keep your eyes and heart open to discover the world around you. If you don’t know what a Digital Nomad is, it is a term that defines the people that work remotely, mainly on their computer or smartphone, keeping Travel Blogs, writing freelance articles, doing reviews and even doing Virtual Assistant jobs for other companies. There are worldschooling families with Digital Nomad parents, the kids are unschooled while traveling, taking in the different cultures and taking part in local activities and customs. The kids learn as they go and at their own pace, what they learn is what they see, what they experience. What is Slow Travel? Well, it pretty much explains itself; it’s traveling slowly, taking your time in each place you visit. It can be a week in one city, a month, maybe even a year or two and taking your time to travel around the area on your own terms, like renting a car and making your own itineraries. Slow Travel also has many possibilities, just like Worldschooling. That is why they fit so well together. Digital Nomads are sometimes Slow Traveleres, but not always. Expats are families that move abroad for work or study, sometimes just on a break (with lots of savings to keep them afloat). Some expats are stationary and some are Slow Travelers. Expat worldschooling families can homeschool, unschool and even do regular school. This is where our family fits in, We are an Expat Family that Slow Travels around Bali and the surrounding areas. Our kids go to a regular school for four hours a day because it helps them greatly with their English and me with my writing (and cooking, and cleaning, and gardening and sometimes doing art). Teaching kids about the world, other cultures, other languages can be done with books, music, movies, activities, museum outings, eating at restaurants that serve food from different countries, even visiting areas like Chinatown or Little India. Really most cities have a Chinatown and a Little India. Immigrants tend to make neighborhoods their own, to feel at home; these are great places to visit and experience when you are Worldschooling from home. 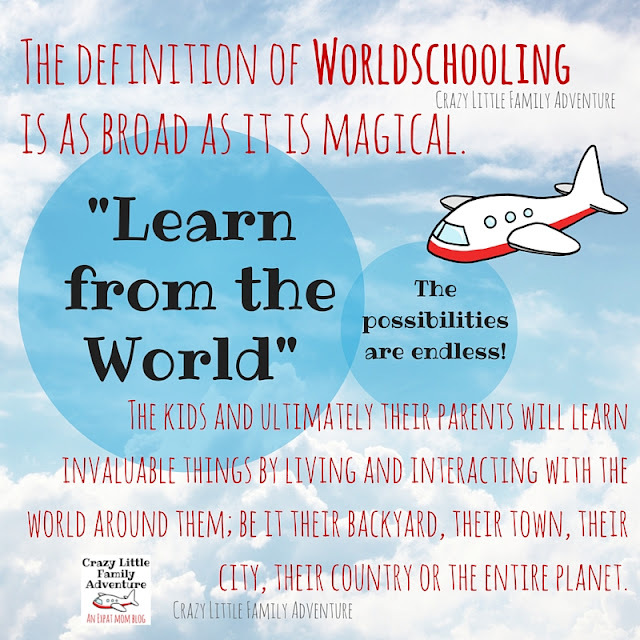 Worldschooling is similar to Unschooling and Radical Unschooling in the sense that the kids learn from living, but it doesn´t end there; Worldschooled kids can be homeschooled or even regular schooled as long as the education is seen with a worldschooling eye. The difference between regular schooling and Radical Unschooling is vast, but families that do either can both be Worldschoolers. Do you see now why Worldschooling is so magical? It´s as varied as the world is large. And yet it also makes the world small enough to discover at length. Worldschooling is all about adventure learning, multiculturalism, multilingualism, being exposed to realities outside your front lawn, or your neighborhood. Worldschooling is the new wave of education, why confine your mind to one little piece of the earth when you can have it all? Worldschooling through Travel and Art is a daily paper.li publication full of articles, stories and resources for homeschooling, unschooling and worldschooling families. You can subscribe to it and always have an endless amount of reading material about the new wave of education. The Worldschoolers Group on FB is a very active group for expert worldschoolers and families that are still thinking about it. The group is very international and is full of resources and very knowledgeable people. The Multicultural Kid Blogs Website is a great community full of expats and slow travelers who have blogs about multilingualism and multiculturalism, especially about education. The Digital Nomads Community on FB is a great resource for Digital Nomads wanting to network with others doing the same all over the world. The Radical Unschooling Group on FB is a very specific group that gives great information about Unschooling and support for families that wish to take that path, Worldschoolers or not. These blogs are some of my favorites and you should also check them out. The RV Classroom This family travels in an RV, essentially a camper van. The mom has the van set up as a mobile schoolroom and it’s pretty impressive! Check our their blog to find out how they do it. Raising Miro on The Road of Life Lainie and her son Miro have been traveling the world for years and are actually the founders of the Worldschooling FB Group. They organize worldschooling teen retreats in South America and have all kinds of adventures that they love to share with all worldschoolers around the globe. The Edventure Project is Hannah’s family’s website and it’s all about “Combining Education and Adventure for Families Everywhere”. This is a family I have following for a long time. Their adventures are incredibly inspiring. Bohemian Travelers This is a Digital Nomad family that write about Travel Schooling around the world with their three kids. My Kiddos loved the posts about Hawaii and the photos of the Kilauea Lava Flow. Worldschool Adventures is a blog about a Slow Travel Family that leaves home six months of the year to Unschool their kids in some new favorite spot in the world. Do you have any other resources I should include here? Maybe other blogs, or books that can help Worldschooling families and the families that are thinking about embarking on that adventure? Thanks for stopping by and reading what will probably be the first chapter of my Worldschooling E-Book. Hi! I’m Orana, an artist of many trades and creator of the Crazy Little Family Adventure Blog. I have been writing about my family’s Adventures in Worldschooling through Travel and Art since 2013. Take a seat and have a look around. Would you like to Work with Me? I can write for your blog or we can talk about a collaboration piece on my site. I am available for PR collaborations any time! Just send me an email through the form below! Thank you so much for writing such a helpful article and sharing these resources! Traveling with school-age children is a daunting task and I'm just beginning to research this to see if it's something we can do with my toddler!